I will be a Triathlete for 2 years in July this year! I've already set goals on certain events I want to do. St Anthony's was one from the start. 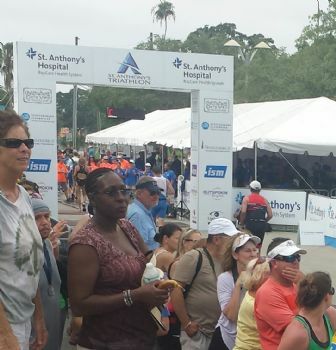 This year I would do my first Tri in the 65-99 Age Group and St Anthony's was it! 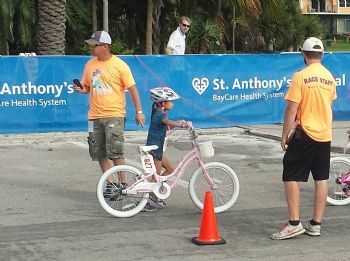 The Saturday before my Tri, I went to the Expo and spent time watching a friend's 6 year old daughter do the Meek and Mighty Tri. This was a distance adjusted event for first timers and youth. 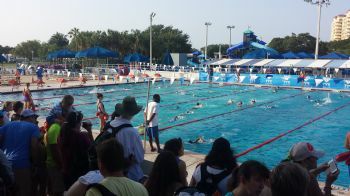 The adults started first with a Pool Swim 200 yards • Bike 5.4 miles • Run 1 mile. The last adult person (44 years old) in the water was having issues. I believe she wasn't ready to do this event. I found it hard to believe she was cleared to do it and it was obvious, she hadn't trained properly. I felt so bad for her and wondered about her support group! You must respect any race and train properly to be able to perform! 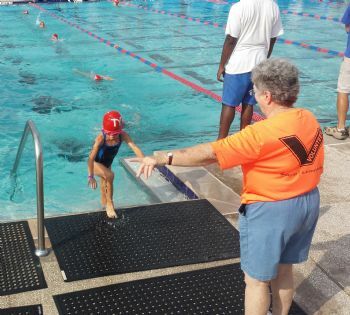 To make a long story short, My Swim Coach (Part of the Swim Support Team) and two others had to start life saving measures on her during the last lap. He also told her to stop earlier! They worked for almost 15 minutes, moved her to the EMT truck but to no avail. It was a very bad scene. Getting ready to own the bike with Daddy watching! 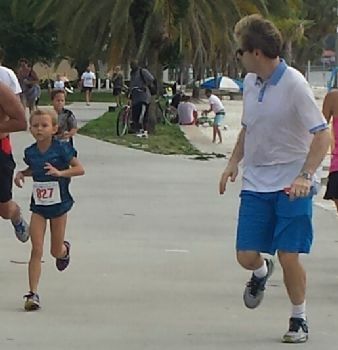 The last 200yds of the race & Daddy running to the Finish Chute with Reyne. She was six years old, raced with the 7 year olds, and beat every 8 year old in the field! This girl is destined for greatness! After the events of Saturday, which weighed on my mind, I went over my race plan. I would be extremely deliberate and safe in my swim form, pace, & breathing. Insure a safe bike, and a solid run. Sunrise in St Petersburg over Tampa Bay! 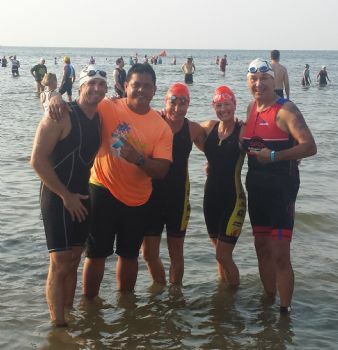 Waiting for our wave with my Swim Coach Leo & some of my local heroes. They were giving me advice up until the air horn sounded! Nailed a solid swim. My adrenaline rush kicked in! 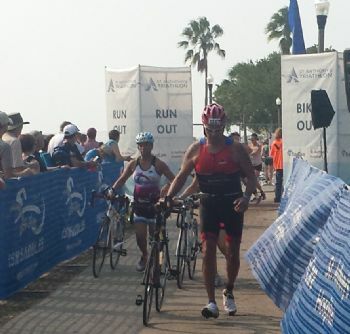 Headed out of T1 and on the bike tour of St Pete! D and several of my friends were waiting for me to enter T2 from the bike. When D saw my smile, she knew I was enjoying life! I was still fueled on endorfins and adrenaline when I hit the run leg! My first mile was the fastest of ll my previous Tris....I hit the wall into Mile 2 and kept moving just to finish! 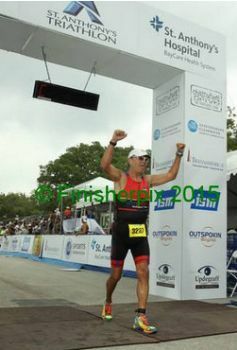 No question, the Finish Chute crowd was loud & cheering...and that got me to the finish line! Time to celebrate with my Team & TriBuds! 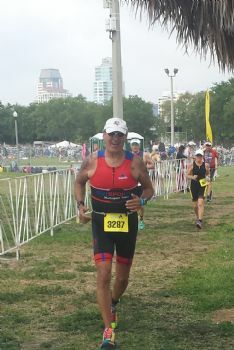 My first Tri in a new Age Group and I made it through safe! 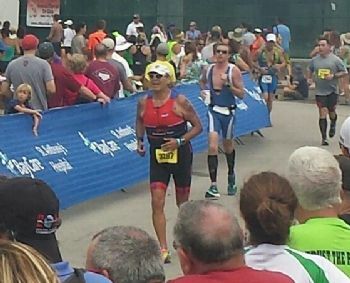 Technically, I learned I had to control my emotions and pace better through my bike and run, my stronger disciplines. 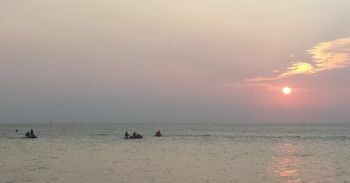 My swim was totally spot on as I focused on safety and achieved my goals. 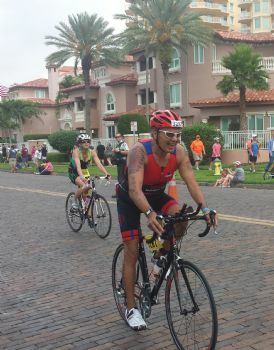 I'll apply my lessons learned in 2 weeks at the Madeira Beach Triathlon! So sad about the lady who had trouble in the swim. It's the swim that is the most dangerous portion, not to be taken lightly. Not good that she was unprepared. 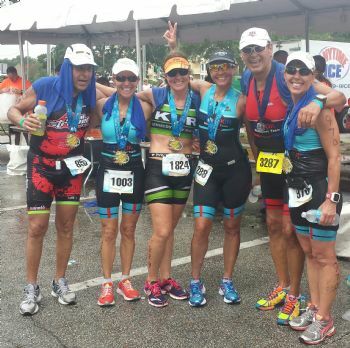 Great pictures of your race - you certainly look prepared and in great shape for your new age group. 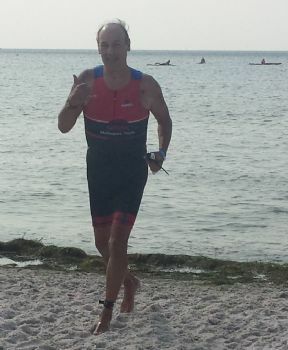 Congratulations on a succesful race and a great blog. There always seems to be a few unprepared folks near me at the start. I listen to them and think "why did you not train, why are you here?" They are so nervous, so stressed. Such an unnecessary risk. 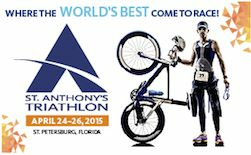 They won't stop making triathlons! Wait until you're ready. So sad for that woman's family. Great job on your race! You look like one happy guy out there having a great time on your bike. Wow looks like it was an amazing experience. Some day I hope to do a full marathon and triathlon. My family and friends think I'm crazy lol. I did a 10k and half marathon and I'm addicted already! Good luck on your upcoming race, enjoy it! Woohoo! Nice race, but yes. Sad, indeed. I have friends that by virtue of age have made it through 10Ks and HMs, etc., but by the skin of their teeth. If I spend the money, I'm doing the prep. And it's a good reminder to think about scheduling a physical, just to check the machine over.
! I sure hope the other person is ok? Very scary! The little one is such a cutie and wow, a little powerhouse! Great job on your race but my deepest sympathies for the family of that girl. Awesome (except for the incident during the first race - not a child, I hope).